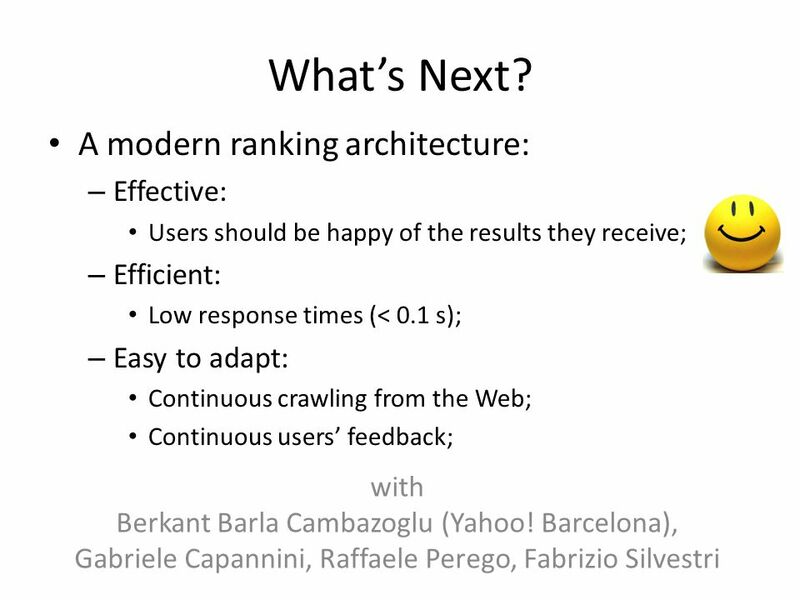 On Enhancing the User Experience in Web Search Engines Franco Maria Nardini. 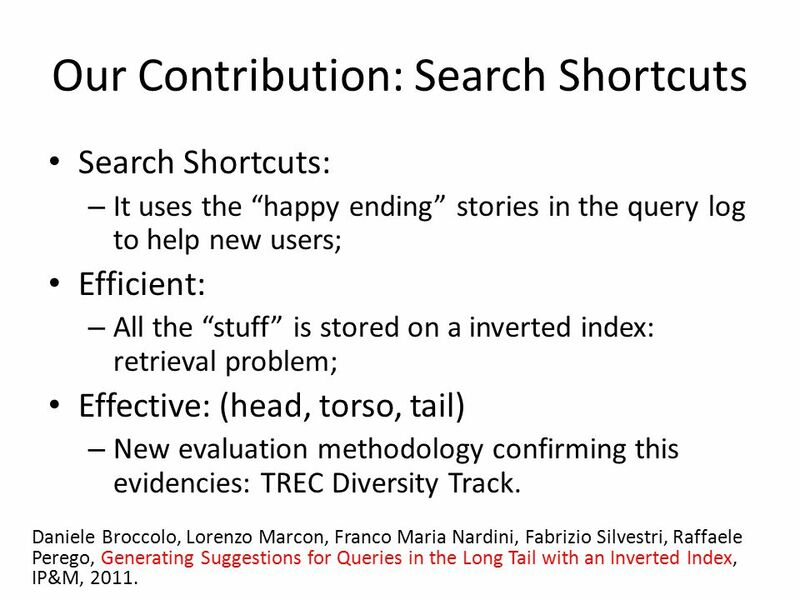 6 Search Shortcuts: – It uses the “happy ending” stories in the query log to help new users; Efficient: – All the “stuff” is stored on a inverted index: retrieval problem; Effective: (head, torso, tail) – New evaluation methodology confirming this evidencies: TREC Diversity Track. 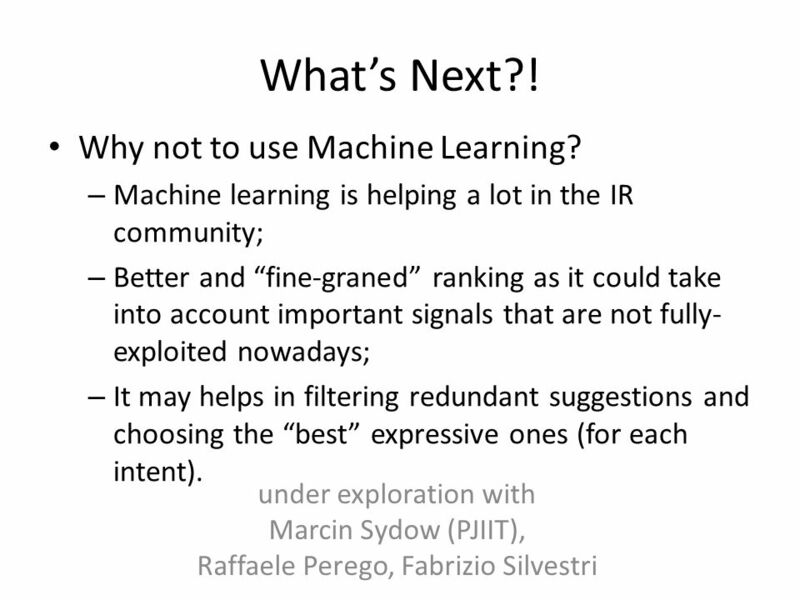 Daniele Broccolo, Lorenzo Marcon, Franco Maria Nardini, Fabrizio Silvestri, Raffaele Perego, Generating Suggestions for Queries in the Long Tail with an Inverted Index, IP&M, 2011. 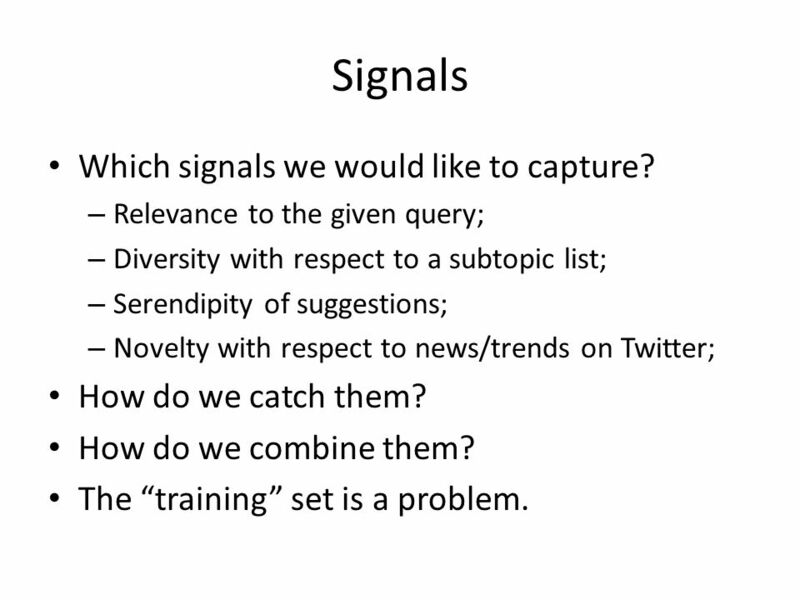 9 Signals Which signals we would like to capture? – Relevance to the given query; – Diversity with respect to a subtopic list; – Serendipity of suggestions; – Novelty with respect to news/trends on Twitter; How do we catch them? How do we combine them? The “training” set is a problem. 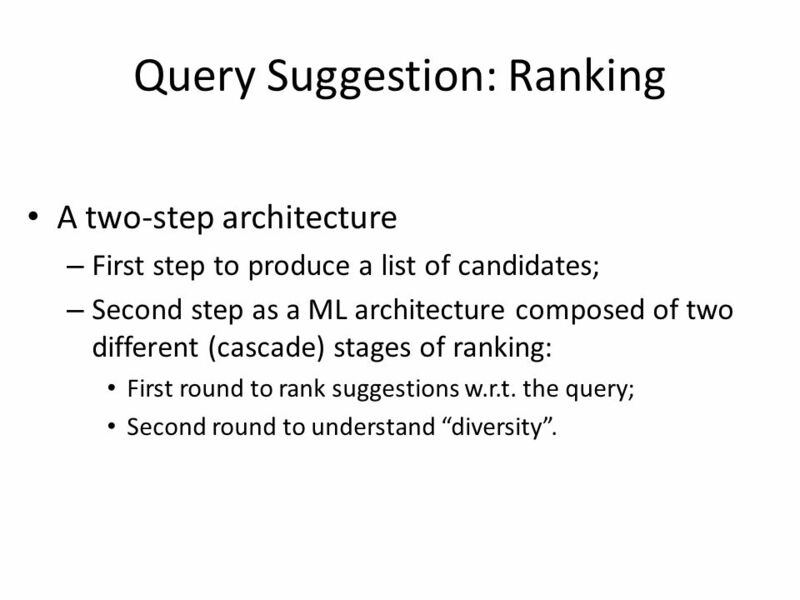 10 Query Suggestion: Ranking A two-step architecture – First step to produce a list of candidates; – Second step as a ML architecture composed of two different (cascade) stages of ranking: First round to rank suggestions w.r.t. the query; Second round to understand “diversity”. 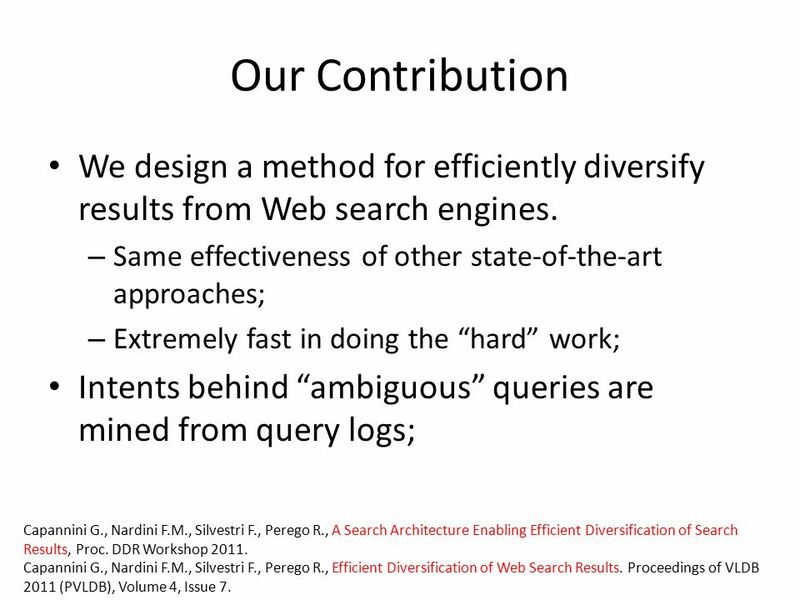 12 Our Contribution We design a method for efficiently diversify results from Web search engines. 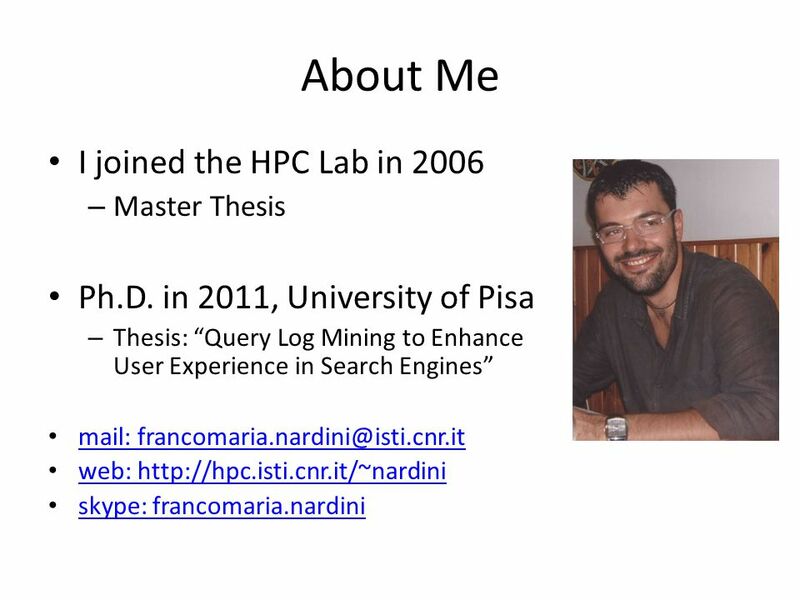 – Same effectiveness of other state-of-the-art approaches; – Extremely fast in doing the “hard” work; Intents behind “ambiguous” queries are mined from query logs; Capannini G., Nardini F.M., Silvestri F., Perego R., A Search Architecture Enabling Efficient Diversification of Search Results, Proc. DDR Workshop 2011. 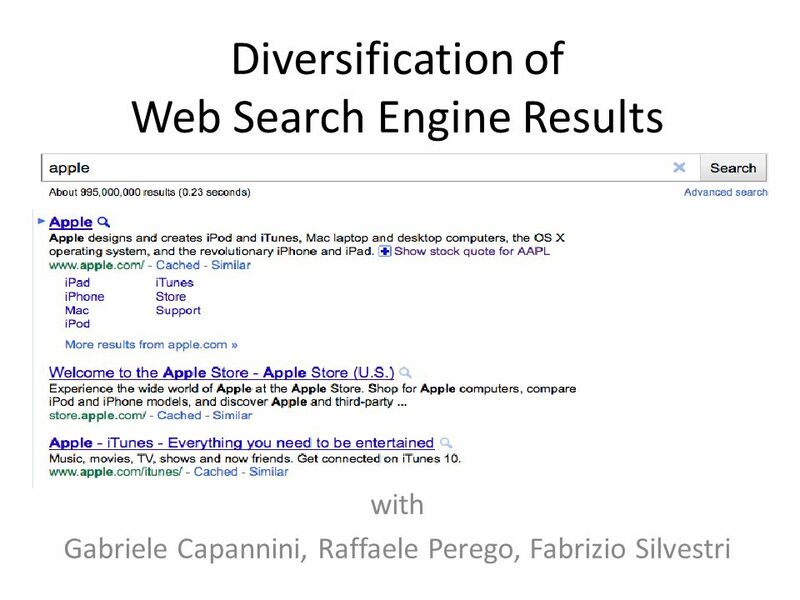 Capannini G., Nardini F.M., Silvestri F., Perego R., Efficient Diversification of Web Search Results. Proceedings of VLDB 2011 (PVLDB), Volume 4, Issue 7. 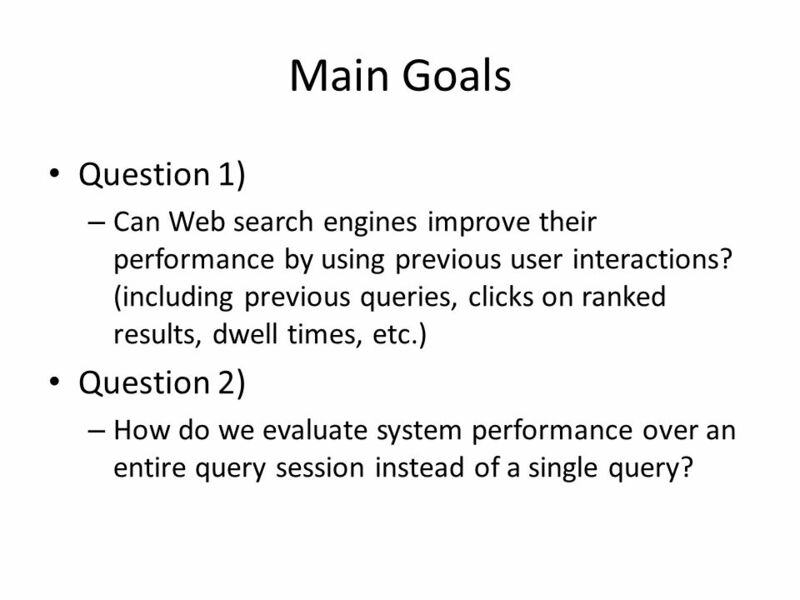 19 Main Goals Question 1) – Can Web search engines improve their performance by using previous user interactions? (including previous queries, clicks on ranked results, dwell times, etc.) Question 2) – How do we evaluate system performance over an entire query session instead of a single query? 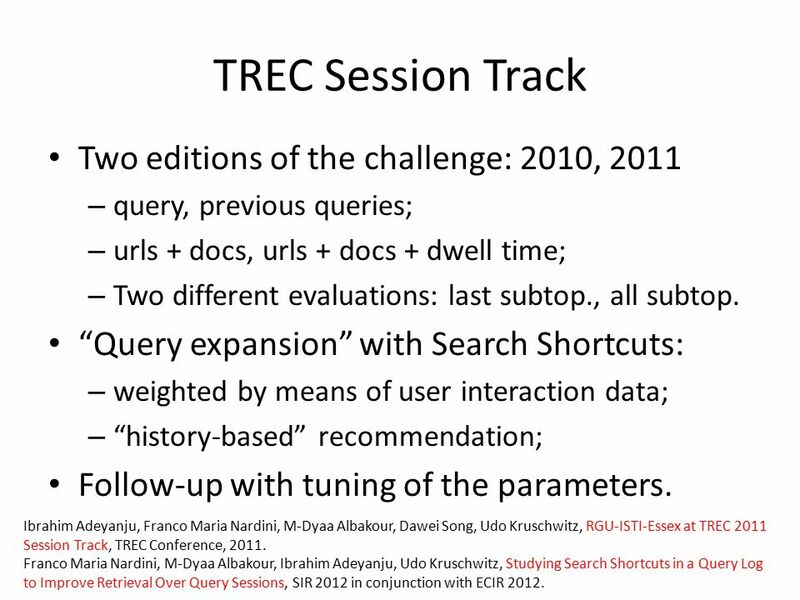 20 TREC Session Track Two editions of the challenge: 2010, 2011 – query, previous queries; – urls + docs, urls + docs + dwell time; – Two different evaluations: last subtop., all subtop. 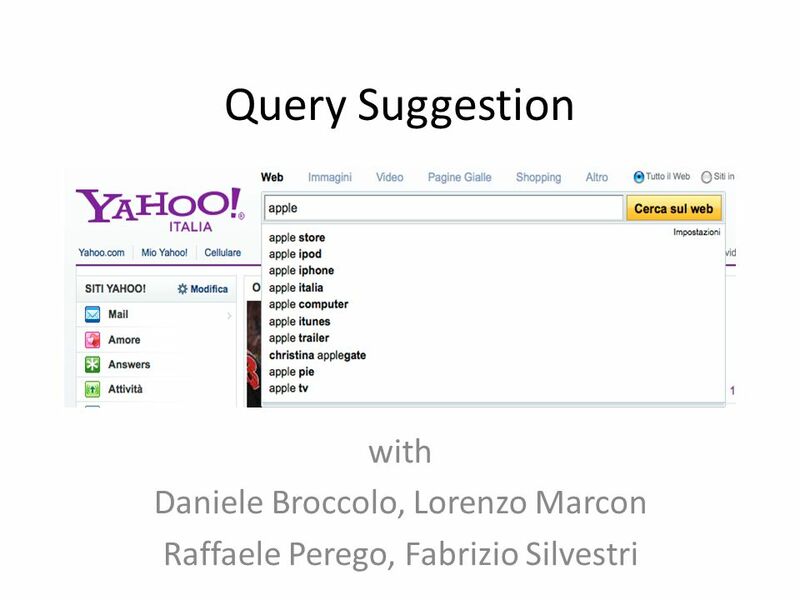 “Query expansion” with Search Shortcuts: – weighted by means of user interaction data; – “history-based” recommendation; Follow-up with tuning of the parameters. Ibrahim Adeyanju, Franco Maria Nardini, M-Dyaa Albakour, Dawei Song, Udo Kruschwitz, RGU-ISTI-Essex at TREC 2011 Session Track, TREC Conference, 2011. 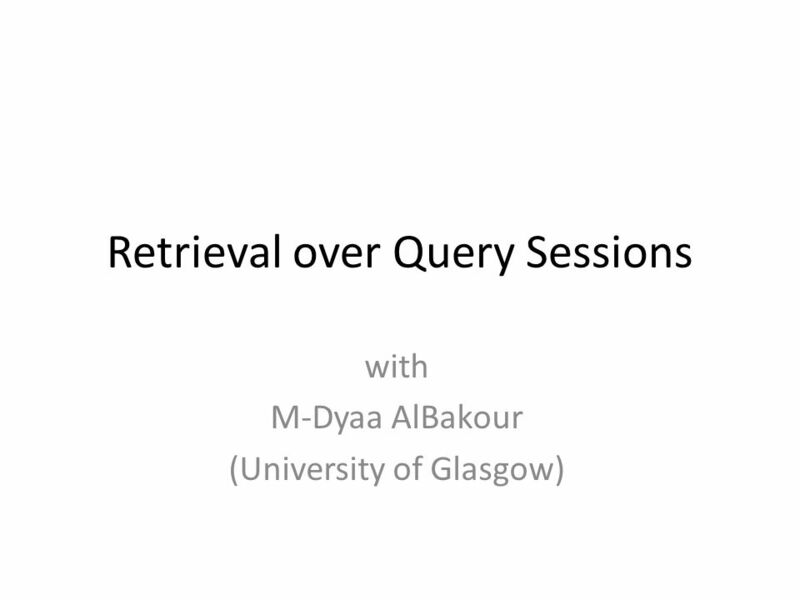 Franco Maria Nardini, M-Dyaa Albakour, Ibrahim Adeyanju, Udo Kruschwitz, Studying Search Shortcuts in a Query Log to Improve Retrieval Over Query Sessions, SIR 2012 in conjunction with ECIR 2012. 21 Some Results What’s Next? Entity-based representation of the user session. 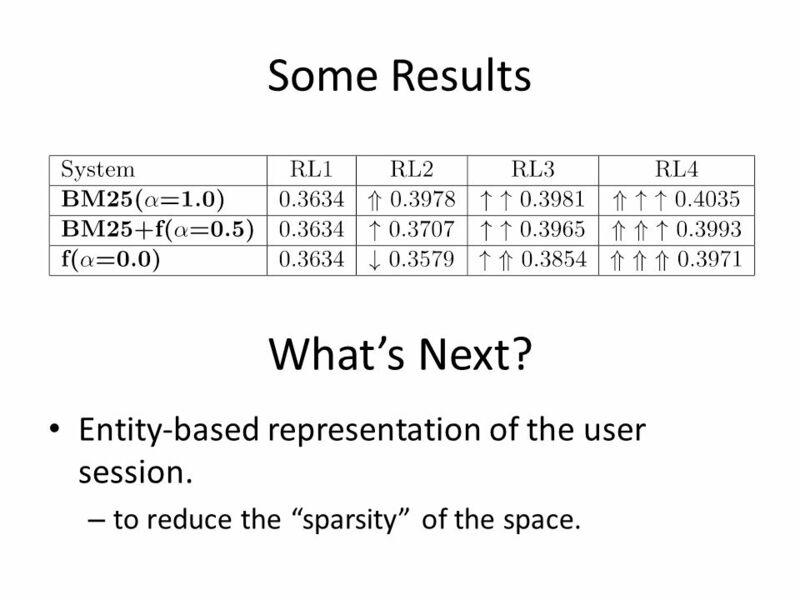 – to reduce the “sparsity” of the space. 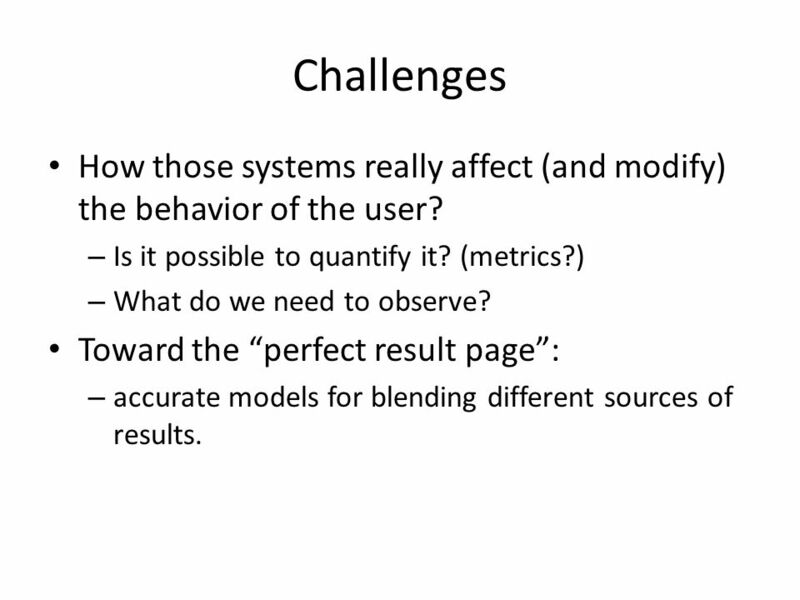 22 Challenges How those systems really affect (and modify) the behavior of the user? – Is it possible to quantify it? (metrics?) – What do we need to observe? 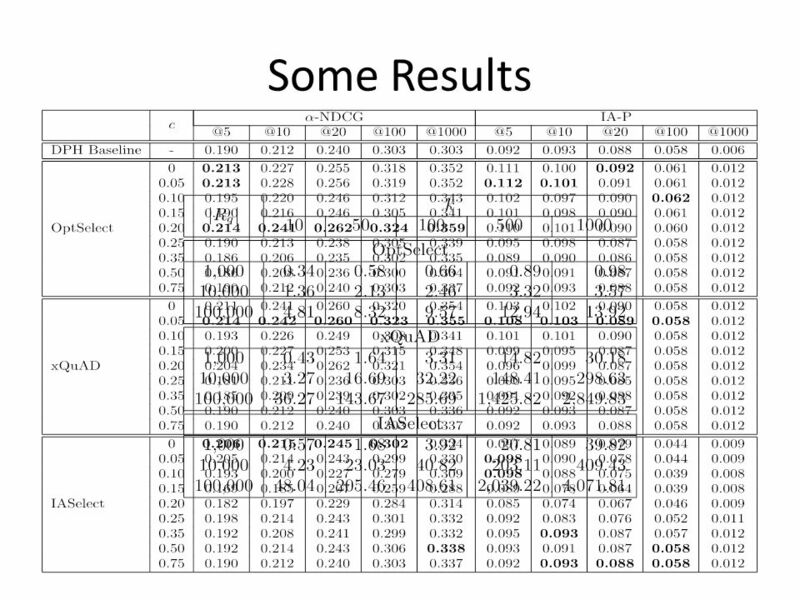 Toward the “perfect result page”: – accurate models for blending different sources of results. 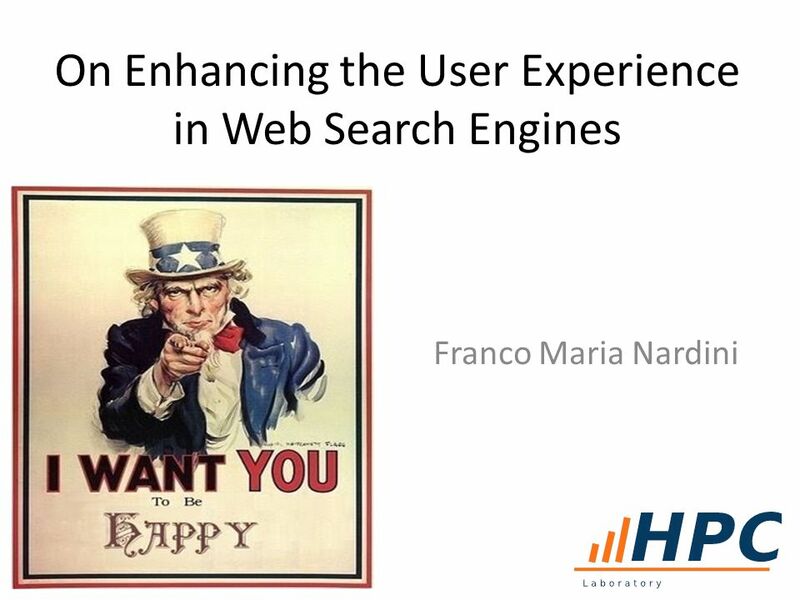 Download ppt "On Enhancing the User Experience in Web Search Engines Franco Maria Nardini." 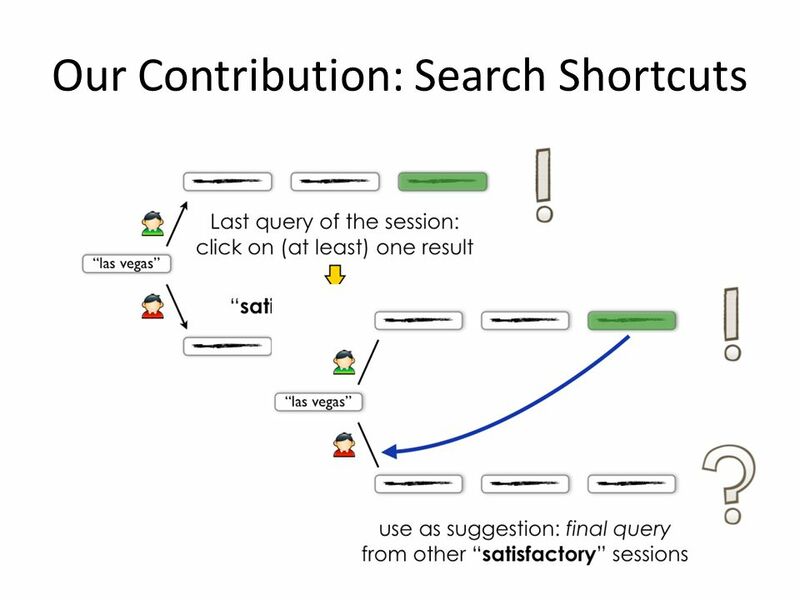 Context-Sensitive Query Auto-Completion AUTHORS:NAAMA KRAUS AND ZIV BAR-YOSSEF DATE OF PUBLICATION:NOVEMBER 2010 SPEAKER:RISHU GUPTA 1. CONTRIBUTIONS Ground-truth dataset Simulated search tasks environment Multiple everyday applications (MS Word, MS PowerPoint, Mozilla Browser) Implicit. Improvements and extras Paul Thomas CSIRO. 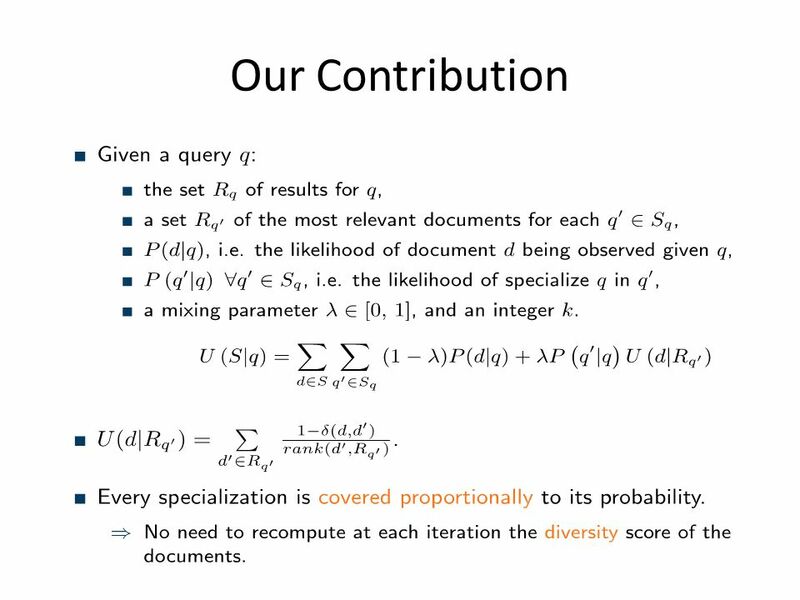 Overview of the lectures 1.Introduction to information retrieval (IR) 2.Ranked retrieval 3.Probabilistic retrieval. 1 Evaluation Rong Jin. 2 Evaluation  Evaluation is key to building effective and efficient search engines usually carried out in controlled experiments. 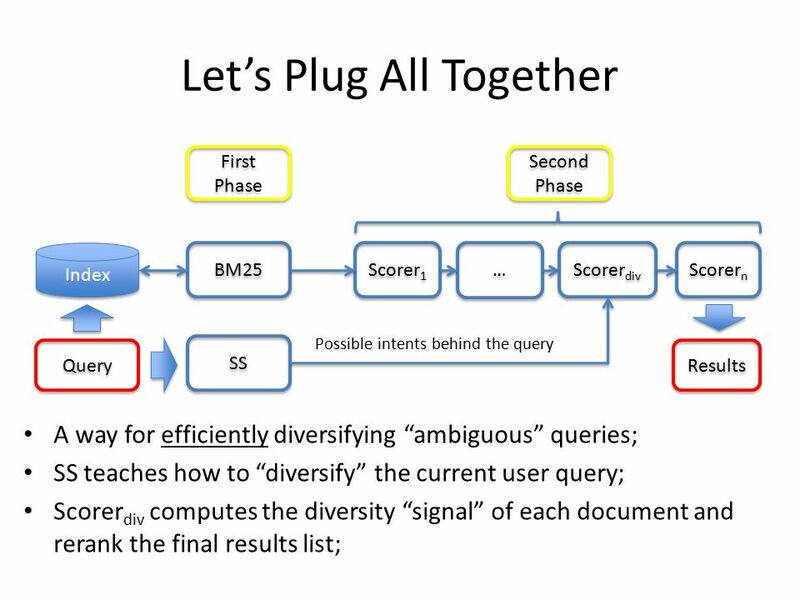 Search Engines Information Retrieval in Practice All slides ©Addison Wesley, 2008. Web Search – Summer Term 2006 I. General Introduction (c) Wolfgang Hürst, Albert-Ludwigs-University. IR & Web Search Engines Architectural design considerations. 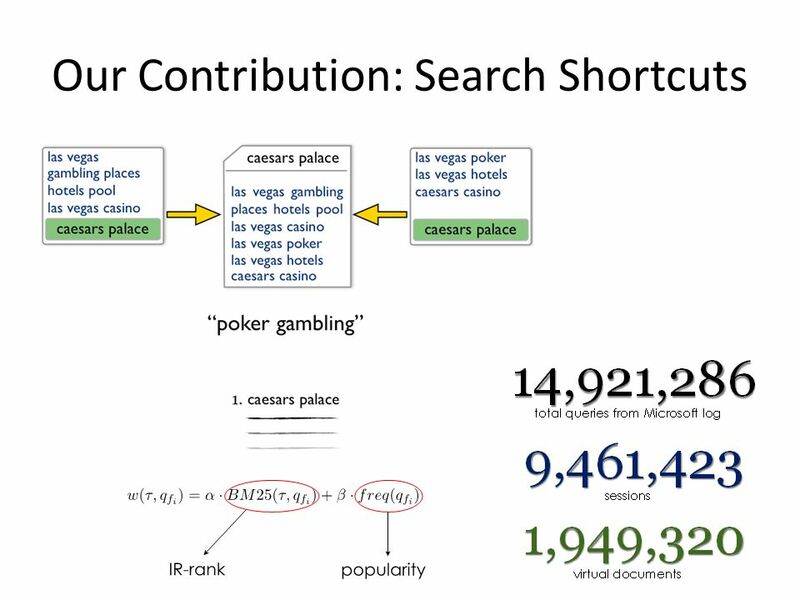 Personalizing Search via Automated Analysis of Interests and Activities Jaime Teevan Susan T.Dumains Eric Horvitz MIT,CSAILMicrosoft Researcher Microsoft. Intelligent Information Retrieval CS 336 Lisa Ballesteros Spring 2006. Ryen W. White, Microsoft Research Jeff Huang, University of Washington. 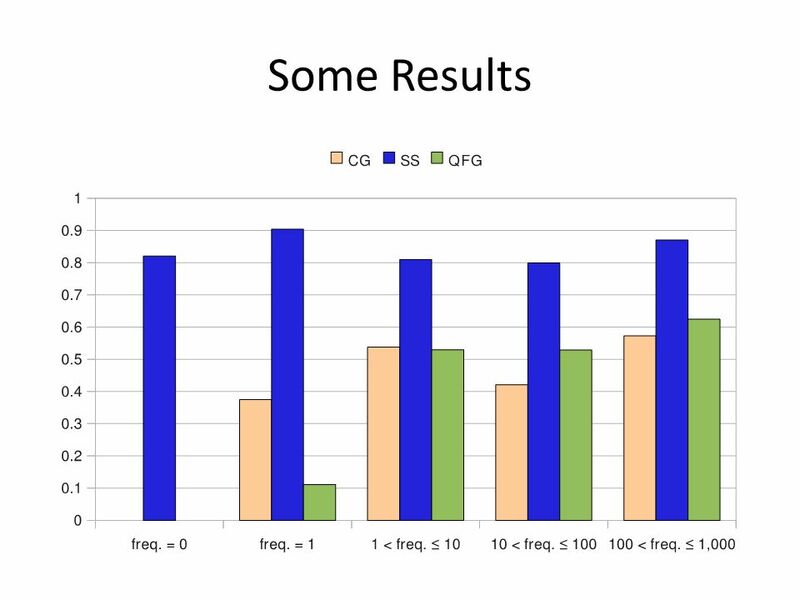 FACT: A Learning Based Web Query Processing System Hongjun Lu, Yanlei Diao Hong Kong U. of Science & Technology Songting Chen, Zengping Tian Fudan University. 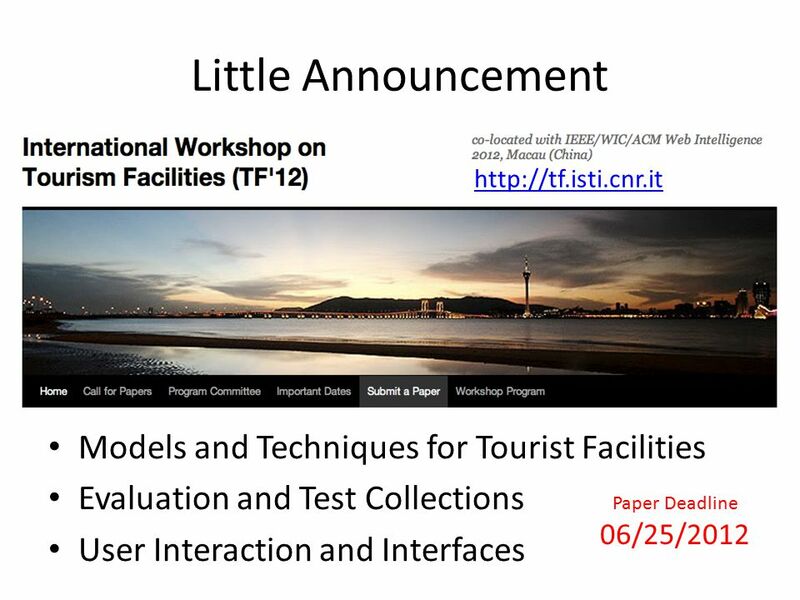 1 Information Retrieval and Web Search Introduction. Recall: Query Reformulation Approaches 1. Relevance feedback based vector model (Rocchio …) probabilistic model (Robertson & Sparck Jones, Croft…) 2. Cluster. Web Logs and Question Answering Richard Sutcliffe 1, Udo Kruschwitz 2, Thomas Mandl University of Limerick, Ireland 2 - University of Essex, UK 3. 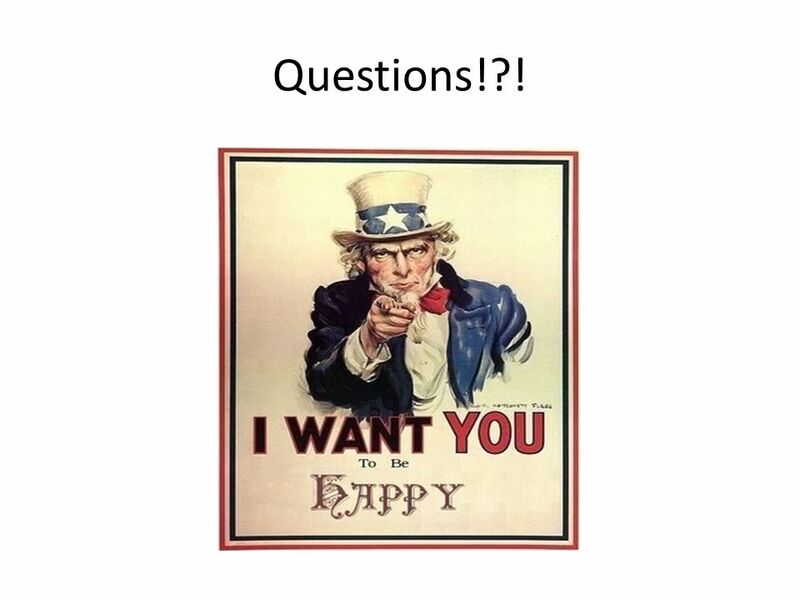 Question Answering.  Goal  Automatically answer questions submitted by humans in a natural language form  Approaches  Rely on techniques from diverse.